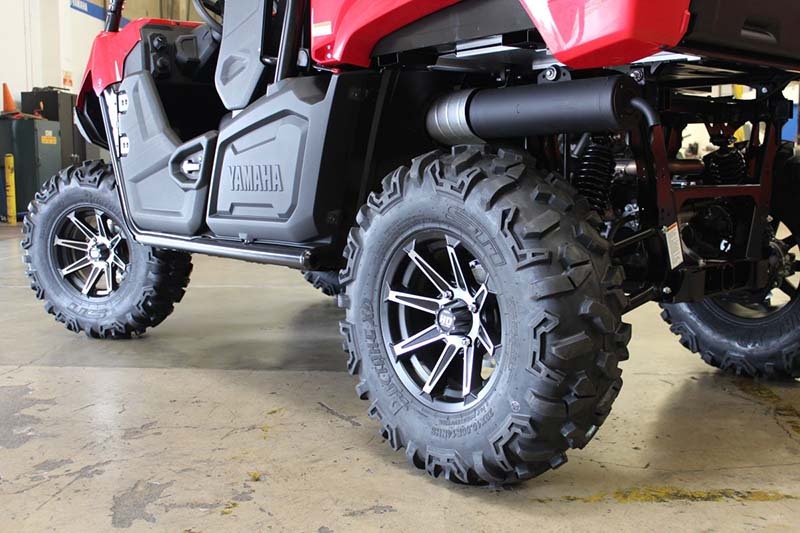 STI Tire & Wheel had the opportunity last week to become the first aftermarket company to bolt tire and wheel products onto the new, 2014 Yamaha Viking side-by-side UTV. We were invited over to Yamaha headquarters in Cypress, California. We brought along a set of 28-inch Roctane XD tires mounted on HD2 wheels (4/110 bolt pattern, 5+2 offset - same as the Yamaha Rhino). The lug nut studs are 12mm so we used STI Lug Nut Part # LUG8, which is a 12mm x 1.25 tapered lug nut. We learned that 28” Roctane tires can be used with no clearance issues. With the Roctanes and HD2s in place, the new Viking looked good. Real good. This UTV comes stock with small tires and plain, black steel wheels. Upgrading to STI makes a massive difference in appearance.